Two G protein-coupled receptors (Edg-2) and (Edg-4) for the lysolipid phosphoric acid mediator lysophosphatidic acid have been described by molecular cloning. However, the calcium-mobilizing receptor Edg-4 is not expressed in some cell lines that exhibit robust calcium responses to this ligand, thus predicting the existence of additional receptor subtypes. We report here on the characterization of a third human lysophosphatidic acid receptor subtype, Edg-7, which mediates lysophosphatidic acid-evoked calcium mobilization. In a rat hepatoma Rh7777 cell line that lacks endogenous responses to lysophosphatidic acid, this lipid mediator, but not others, evokes calcium transients when the cells have been transfected with Edg-7 or Edg-4 DNAs. Furthermore, frog oocytes exhibit a calcium-mediated chloride conductance in response to mammalian-selective lysophosphatidic acid mimetics after injection of Edg-7 mRNA. Edg-7-expressing Rh7777 cells do not show inhibition of forskolin-driven rises in cAMP in response to lysophosphatidic acid. However, membranes from HEK293T cells cotransfected with Edg-7 and Gi2α protein DNAs show lysophosphatidic acid dose-dependent increases in [γ-35S]GTP binding with an EC50 value of 195 nM. When we used this assay to compare various synthetic LPA analogs at Edg-2, Edg-4, and Edg-7 receptors, we found that ethanolamine-based compounds, which are full LPA mimetics at Edg-2 and Edg-4, exhibit little activity at the Edg-7 receptor. Edg-7 RNA was detected in extracts of several rat and human tissues including prostate. Together, our data indicate that Edg-7 is a third lysophosphatidic acid receptor that couples predominantly to Gq/11α proteins. Lysophosphatidic acid (LPA) is a potent extracellular lipid mediator that is released, for example, during platelet activation or by stimulation of adipocyte α2 adrenoceptors (Gerrard and Robinson, 1989; Eichholtz et al., 1993; Valet et al., 1998). LPA elicits a wide variety of responses by cells; prominent among these are cell proliferation (van Corven et al., 1989; Howe and Marshall, 1993;Tokumura et al., 1994) and antiapoptosis (Levine et al., 1997; Weiner and Chun, 1999). LPA and the structurally similar lipid mediator sphingosine-1-phosphate (S1P) are recognized now to signal cells through a set of G protein-coupled receptors (GPCRs) known colloquially as the Edg receptors. Discovered initially as “orphan” receptors (Hla and Maciag, 1990), two members of the group, Edg-2 and Edg-4, have been shown to be LPA receptors. Edg-2 was shown first by Chun's laboratory to mediate LPA activation of MAP kinase and inhibition of adenylyl cyclase in a pertussis toxin (PTX)-dependent manner and to induce cell shape changes in a Rho-dependent manner (Hecht et al., 1996). An and colleagues (1998a,b) showed that LPA binding to Edg-4 results in activation of PLCβ with subsequent calcium mobilization in a PTX-independent manner. However, expression of Edg-4 (as judged by RNA accumulation) is restricted primarily to leukocytes, suggesting the presence of another LPA receptor that couples to the Ca2+ mobilization elicited by LPA treatment in a wide variety of other cell types (An et al., 1998a). In this study, we report cloning and characterization of a novel human LPA receptor cDNA, Edg-7, from HEK 293 and PC-3 cells and show functional coupling of Edg-7 to calcium mobilization. While this manuscript was in initial review, another group published a paper characterizing this same LPA receptor (Bandoh et al., 1999). Although much of our data agrees with the findings of Bandoh and colleagues, our results contradict their observation that Edg-7 does not respond to LPAs with saturated acyl functionalities. Cloning of Human Edg cDNAs—Edg-7. A partial nucleotide sequence similar to Edg-2 and Edg-4 was found in a published patent application by Ellis et al., wherein the cDNA clone was named HOFNH30 (patent EP0878479A). Using that nucleotide sequence as a guide, we amplified via reverse transcription-polymerase chain reaction (RT-PCR) a 1022 base pair fragment from HEK293 cell RNA (oligonucleotide primers: forward 5′-ccacaatgaatgagtgtcact, reverse 5′-tttatactggctgcccgt). Although stated in the patent application to be the full translational open reading frame (ORF), our nucleotide sequence analyses of multiple cDNAs from independent RT-PCR reactions differed consistently from the patent application sequence, most problematically in that all our cDNAs lacked an in-frame translational termination codon. Subsequent 3′ rapid amplification of cDNA ends (RACE), nested oligonucleotide primers 5′-tctggacagtgtccaacc and 5′-ccatcatcctactcctacaagg) and subcloning allowed us to identify an in-frame termination codon and, ultimately, to use RT-PCR to isolate full-length DNAs from a mixture of HEK293 and PC-3 cell RNAs (primers: forward 5′-ccacaatgaatgagtgtcact, reverse 5′-aaatctagaagtgattaatggagacc). The resultant product (1191 base pair) of one of these cDNAs, which contained the full coding sequence, was subcloned into the plasmid expression vector pCR3.1. Edg-4, the full translational ORF of human Edg-4, as reported by An et al. (1998a) is contained within an expressed sequence tag (EST) cDNA (accession no. aa419064) . We obtained this cDNA from the I.M.A.G.E. Consortium via Research Genetics (Birmingham, AL) and subcloned the ORF into the expression plasmid pcDNA3.1neo. However, this cDNA contains a translational frame shift compared with the sequence of two Edg-4 genomic clones (accession nos. 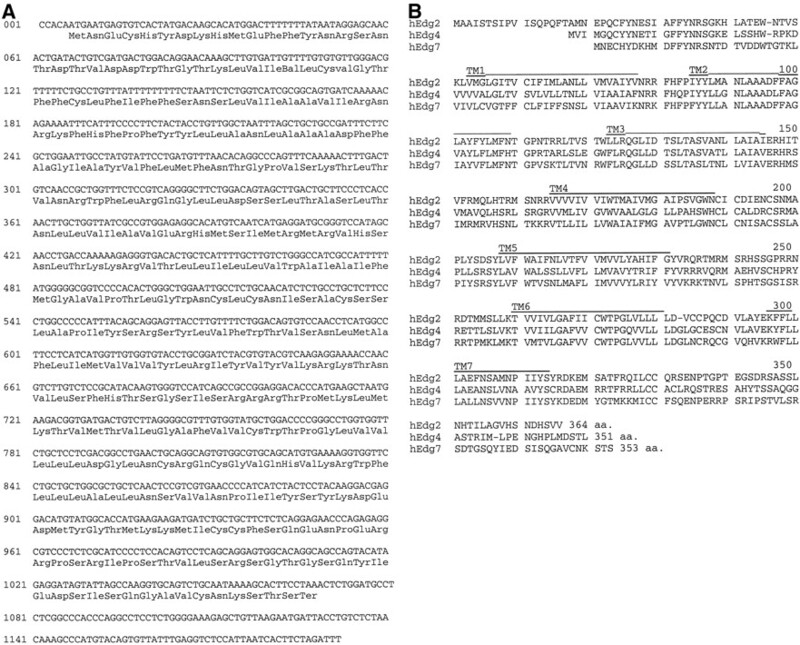 ac002306 and ac011458) as well as another EST sequence resulting in a different C terminus. Therefore, we mutated our Edg-4 cDNA to conform to the consensus sequence; this cDNA is expressed in pcDNA3.1. Edg-2, the full translational ORF encoding mouse Edg-2, was subcloned into the expression plasmid pcDNA3 as reported previously (Hooks et al., 1998). Using the T7 RNA polymerase and the Edg-7 pCR3.1 DNA as a template, we transcribed Edg-7 mRNA in vitro in the presence of a capping analog. This mRNA was injected into defolliculated stage V–VI Xenopus laevis oocytes. After ∼60 h, responses to applied compounds were recorded from individual oocytes held under a two-electrode voltage clamp. The preparation of the oocytes and the conditions for our recordings were as described previously (Durieux et al., 1993; Hooks et al., 1998). Transient Expression in HEK293T Cells. The appropriate Edg plasmid DNA was mixed with an equal amount of an expression plasmid (pcDNA3) encoding a mutated (C351F) rat Gi2α protein, and these DNAs were used to transfect monolayers of HEK293T cells (in which T indicates expression of the simian virus 40 large T antigen) using the calcium phosphate precipitate method (Wigler et al., 1977). After ∼60 h, cells were harvested and membranes were prepared, aliquoted, and stored at −70°C until use. Stable Expression in Rh7777 Cells. Rh7777 cell monolayers were transfected with the indicated Edg plasmid DNAs using the calcium phosphate precipitate method, and clonal populations expressing the neomycin phosphotransferase gene were selected by addition of geneticin (G418) to the culture medium. The Rh7777 cells were grown in monolayers at 37°C in a 5% CO2/95% air atmosphere in growth medium consisting of 90% MEM, 10% fetal bovine serum, 2 mM glutamine, and 1 mM sodium pyruvate. Measurement of Calcium Transients and cAMP Accumulation. Assays of calcium mobilization and adenylyl cyclase activity were performed as described previously by us (Lynch et al., 1997). 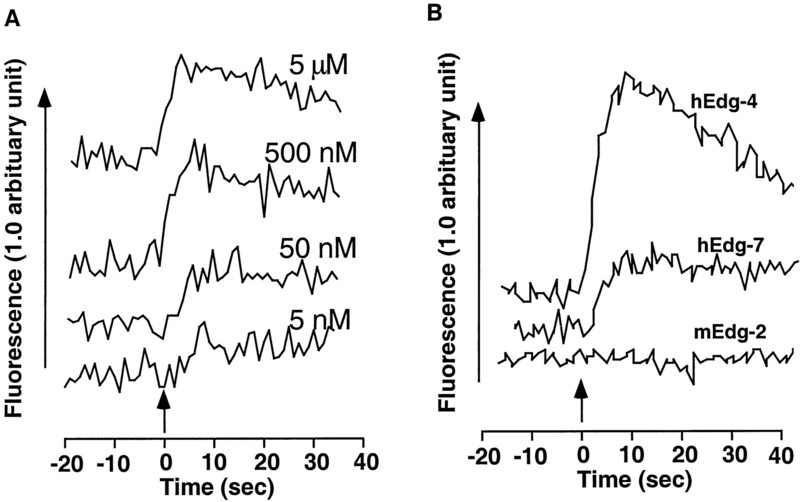 Briefly, intracellular calcium fluxes were measured on cell populations (2–4 × 106 cells) that had been loaded with the calcium sensitive fluorophore INDO-1 in the presence of 2 mM probenecid. Responses were measured in a temperature-controlled fluorimeter (Aminco SLM 8000C, SLM Instruments, Urbana, IL). Lipids were delivered as aqueous solutions containing 0.1% (w/v) fatty acid-free BSA; this vehicle was determined to elicit no response. Assays of adenylyl cyclase activity were conducted on populations of 5 × 105 cells stimulated with 1 μM forskolin in the presence of the phosphodiesterase inhibitor isomethylbutylxanthine. cAMP was measured by automated radioimmunoassay. Briefly, 25 μg of membranes from Edg-7 (or Edg-2 or Edg-4) and Gi2αC351F DNA transiently transfected HEK293T cells were incubated in 1.0 ml of GTP-binding buffer (in mM: HEPES 50, NaCl 100, MgCl2 10, pH7.5) containing 25 μg saponin, 10 μM GDP, 0.1 nM [γ-35S]GTP (1200 Ci/mmol), and indicated lipid for 30 min at 30°C. Samples were analyzed for membrane-bound radionuclide using a Brandel Cell Harvester (Gaithersburg, MD). For this assay, receptor was coexpressed with rat Gi2α in which amino acid 351 (normally cysteine) had been changed by mutagenesis to phenylalanine. The C351F mutation renders the protein resistant to inactivation by PTX or the alkylating agent N-ethylmaleimide. RT-PCR analysis was performed using the Titanô One Tube kit. Oligonucleotide primers used to amplify human Edg-7 were forward 5′-tctggacagtgtccaacc, reverse 5′-ataggacaagcagggacc. RNA extraction, Northern blotting, and hybridization of radiolabeled Edg-7 DNA were as described previously by us (O'Dowd et al., 1996). Rh7777 cells (CRL 1601) were from the American Type Culture Collection (Manassas, VA). HEK293T cells were a gift from Dr. Judy White (University of Virginia), PC-3 cells were a gift from Dr. Charles Myers (University of Virginia), human Edg-1 cDNA was a gift from Dr. Tim Hla (University of Connecticut), human Edg-3 cDNA was a gift from Dr. Songzhu An (University of California at San Francisco), N-acylethanolamide phosphates andN-palmitoyl-l-serine phosphate were gifts from Dr. Timothy L. Macdonald (University of Virginia), 1-oleoyl LPA, 1-palmitoyl LPA and 1-myristoyl LPA, and other lysophospholipids were obtained from Avanti Polar Lipids (Alabaster, AL). S1P was obtained from Biomol (Plymouth Meeting, PA), [γ-35S]GTP from New England Nuclear (Boston, MA), 3′ RACE kit, geneticin, cell culture media, and sera from Life Technologies (Bethesda, MD), human northern blot membrane from Clontech (San Diego, CA), oligonucleotides from Operon Technologies (Alameda, CA), and the RT-PCR kit (Titanô One Tube) from Boehringer Mannheim (Indianapolis, IN). Expression plasmids were from Invitrogen (La Jolla, CA), and other chemicals were from Sigma (St. Louis, MO). Figure 1A shows the DNA sequence and deduced amino acid sequence of human Edg-7. This sequence is from a single cDNA, but it is the same sequence we found in four independent cDNAs obtained by RT-PCR and three partial cDNAs obtained by 3′ RACE of HEK293 cell RNA. Thus we are confident that the sequence we report represents the coding region of the Edg-7 mRNA population in HEK293 cells. However, our sequence differs substantially from the patent application sequence (EP0878479A) most prominently regarding a translational reading frame shift in the C-terminal region. We do not know why these sequences differ; perhaps they represent two alleles. Using the BLAST (Atschul et al., 1990) and FASTA (Pearson and Lipman, 1988) search tools, we found no record of a human Edg-7 DNA sequence in any division of the Genbank database. However, recently a mouse kidney cDNA sequence that is >90% identical (amino acids) to human Edg-7 appeared in the EST division. Our Edg-7 sequence has been deposited with the GenBank (accession no. AF186380). A, the nucleotide and deduced amino acid sequence of the human Edg-7 DNA. The thymidylic acid residue at position 1184 was introduced to create a XbaI restriction endonuclease site during the cloning process. This sequence can be retrieved as a GenBank flat file using accession no. af186380. B, alignment of the Edg-2, Edg-4, and Edg-7 proteins created using the PILEUP algorithm of the GCG program. Potential transmembrane regions are overscored; gaps are indicated by dashes. The conceptualized human Edg-7 protein (353 amino acids, 40,081 Da) is 52% identical with human Edg-2, 48% identical with human Edg-4, 34 to 37% identical with the human S1P receptors Edg-1, Edg-3, Edg-5, and Edg-8 (Im et al., 2000), and 36% identical with the human orphan receptor Edg-6. All other known rhodopsin family GPCRs share <28% identical amino acids. Hydropathy analysis of Edg-7 (data not shown) suggests that the heptahelix structure assumed to be common to GPCRs and the protein has the conserved amino acid motifs expected of a rhodopsin-like (family A) GPCR. The high similarity between Edg-7 and the known LPA receptors Edg-2 and Edg-4 (Fig. 1B) prompted us to test the former as a potential LPA receptor. In testing for LPA receptor activity, we compared Edg-7 with Edg-2 and Edg-4. We introduced these DNAs individually into Rh7777 rat hepatoma cells by transfection and selected for geneticin-resistant clonal populations. Rh7777 cells were chosen because they were reported (Fukushima et al., 1998) to exhibit minimal responses to high concentrations (10 μM) of LPA but respond to LPA after transfection with Edg-2. In Edg-7 transfected cell populations, calcium transients were evoked by LPA (Fig. 2A) with an EC50 value estimated to be ∼100 nM. As predicted from previous reports (An et al., 1998a,b), we also detected calcium mobilization in Edg-4 DNA transfected, but not Edg-2 DNA transfected, cell populations (Fig. 2B). This calcium mobilization was not blocked by previous treatment with PTX (data not shown), suggesting the involvement of PTX-insensitive G proteins, most probably Gq/11α. 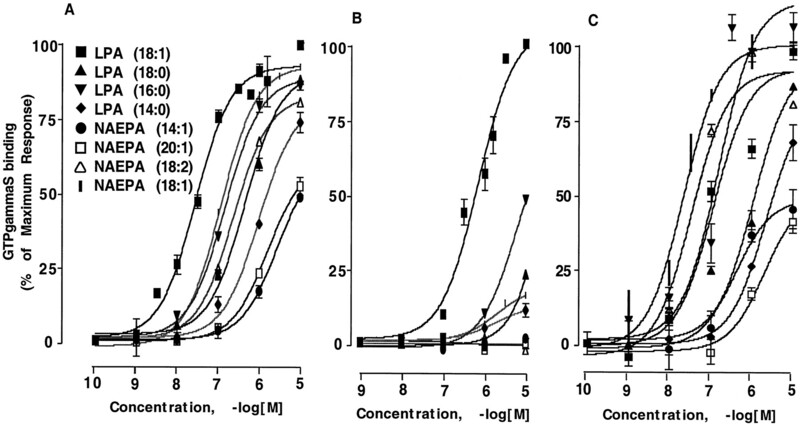 It is noteworthy that other phospholipids, including lysophosphatidyl-choline, -serine, -inositol, -ethanolamine, -glycerol, and sphingosinephosphorylcholine did not evoke calcium transients in these cells at concentrations up to 10 μM (data not shown). Calcium mobilization in Rh7777 cells transfected with Edg-2, Edg-4, and Edg-7 DNAs. A clonal population of Rh7777 cells transfected with Edg-7 DNA was loaded with the calcium fluorophore INDO-1 and aliquots challenged with the 1-oleoyl LPA at the indicated concentrations (A). Clonal populations transfected with the indicated Edg DNAs were challenged with 10 μM of 1-oleoyl LPA (B). As a second test of calcium mobilization mediated by Edg-7, we injected the cognate mRNA into frog oocytes and measured changes in the calcium-gated chloride conductance in response to applied lipids. 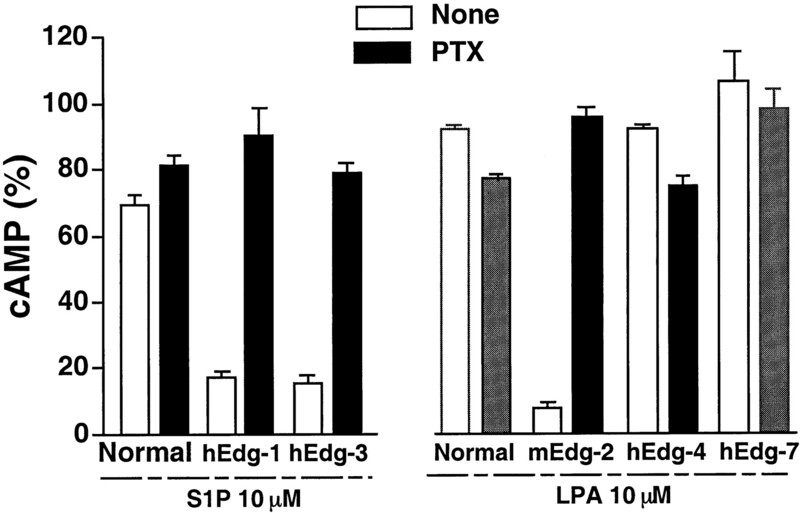 In this assay system, a strong endogenous response to LPA (Durieux et al., 1992) necessitates the use of mammalian receptor-selective LPA mimetics in lieu of LPA. Two such compounds, N-oleoyl ethanolamide phosphoric acid (NOEPA) and N-palmitoyl serine phosphoric acid (l-NPSPA), in which ethanolamine orl-serine replaces the glycerol of LPA (Suguira et al., 1994), meet this requirement (Hooks et al., 1998). As is shown in the recordings (Fig. 3, B and D), Edg-7 mRNA-injected oocytes, but not control oocytes (Fig. 3, A and C), responded to applied NOEPA and l-NASPA. This is similar to the response to these compounds observed with Edg-4 mRNA-injected oocytes (C.E.H., D.-S.I., and K.R.L., unpublished observations). Responses of oocytes injected with Edg-77 mRNA to LPA mimetics. Individual frog oocytes were held under two-electrode voltage clamp and challenged with two different LPA mimetics at the concentration shown. 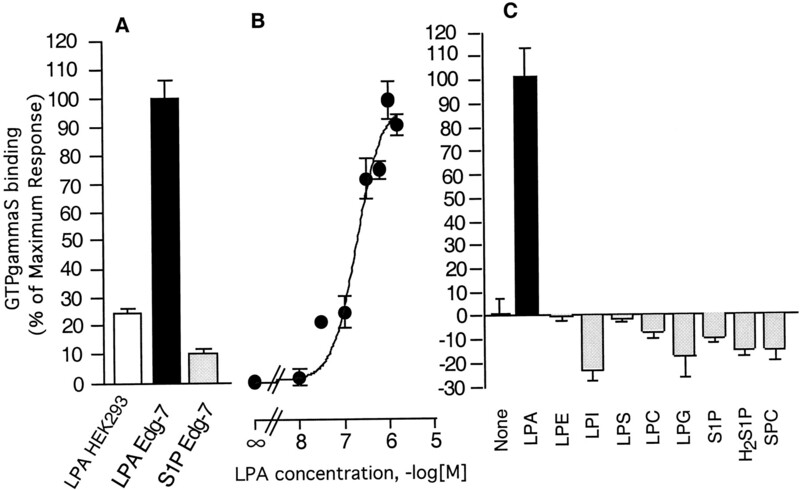 l-NPSPA (Sugiura et al., 1994) is a competitive antagonist of the oocyte LPA response (Liliom et al., 1996), but a partial agonist of mammalian LPA responses (Hooks et al., 1998). NOEPA is a fully potent LPA mimetic at mammalian cells (Sugiura et al., 1994; Lynch et al., 1997), but is ∼100-fold less potent than LPA on the oocyte (C.E.H., D.-S.-I., and K.R.L., unpublished data). Some recombinant Edg receptors such as the S1P receptors Edg-3 and Edg-5 couple through both Gq/11α and Gi/oα proteins (An et al., 1997; Gonda et al., 1999; Okamoto et al., 1999; Sato et al., 1999). To determine whether a similar situation might exist with Edg-7, we tested for inhibition of forskolin-induced cAMP accumulation by LPA in Edg-7-expressing Rh7777 cell populations. By way of comparison, we also tested clonal Rh7777 populations expressing the S1P receptors Edg-1 and Edg-3 as well as the LPA receptors Edg-2 and Edg-4. LPA at concentrations up to 10 μM did not blunt the forskolin-driven rises in cAMP accumulation in Edg-7-expressing cells, indicating a lack of coupling of to Gi/oα proteins in this system (Fig.4). In keeping with published reports (An et al., 1997; Fukushima et al., 1998; Gonda et al., 1999; Okamoto et al., 1999; Sato et al., 1999), we found that Edg-2 but not Edg-4 inhibited cAMP accumulation in response to LPA, whereas S1P treatment (10 μM) resulted in a marked inhibition in both Edg-1- and Edg-3-expressing Rh7777 cells. As expected, pretreatment of cultures with PTX (100 ng/ml, 24 h) blocked the inhibition of forskolin-induced rises in cAMP. In no case did we observe increased accumulation of cAMP in Edg receptor-expressing Rh7777 cell lines. Inhibition of forskolin-evoked cAMP accumulation in Edg DNA transfected Rh7777 cells. Clonal populations of Rh7777 cells, either mock-transfected (normal) or transfected with the indicated Edg receptor, were treated with forskolin and challenged with S1P or LPA. The absolute values for cAMP accumulation are basal (i.e., IBMX alone) = 8.5 ± 1.4 pmol/well, IBMX + forskolin (100%) = 111.8 ± 13.8 pmol/well. Although recombinant Edg-7 failed in our hands to couple to endogenous Gi/oα proteins when expressed in Rh7777 cells, coexpression of receptor and G protein by cotransfection of their DNAs might result in observable receptor/G protein coupling. If so, we could use a [γ-35S]GTP binding assay to detect receptor/G protein pairs. Lacking a fully validated radiolabeled LPA binding assay, such a demonstration is important to demonstrate unequivocally that LPA signals directly through Edg-7. Therefore, we introduced Edg-7 and Gi/oαC351F DNAs by transfection into HEK293 T cells and, after 2 d, prepared membranes. In these membranes, LPA increased [γ-35S]GTP binding in a dose-dependent manner, with an EC50 value of 195 nM (Fig. 5, A and B). Although HEK293 T cells exhibit an endogenous response to LPA, mock transfected cells showed only 20% of the response to LPA (Fig. 5A). Thus Edg-7 and Gi/oα interactions can occur, albeit when both recombinant proteins are expressed at artificially high levels.l-NPSPA also stimulated [γ-35S]GTP binding in this assay (data not shown) as predicted from the oocyte responses shown in Fig. 2. However, a number of other lipids including S1P, dihydro S1P, sphingosylphosphorylcholine, and lysophospholipids with glycerol, choline, serine, inositol, and ethanolamine head groups did not stimulate [γ-35S]GTP binding in these membranes (Fig. 5C). [γ-35S]GTP binding to HEK293T cell membranes in response to 1-oleoyl LPA and S1P. A, the histogram shows the stimulation of [γ-35S]GTP binding in response to 1 μM LPA or S1P. B, the absolute values for [γ-35S]GTP binding are basal (no drug) 5880 ± 214 dpm and maximum 11789 ± 127 dpm. Each data point represents mean of six determinations ± S.E. C, each lipid was tested at a concentration of 1 μM. LPE indicates lysophosphatidyl ethanolamine; LPI, lysophosphatidyl inositol; LPS, lysophosphatidyl serine; LPC, lysophosphatidyl choline; LPG, lysophosphatidyl glycerol; H2S1P, dihydrosphingosine 1-phosphate; SPC, sphingosylphosphoryl choline. The availability of the [γ-35S]GTP binding assay provides an opportunity to measure the relative potencies and efficacies of synthetic LPA analogs at defined receptors without the confounding influence of endogenous LPA receptors. We exploited this opportunity by comparing the activity at Edg-2, Edg-4, and Edg-7 of a set of LPA analogs wherein the glycerol backbone is replaced by ethanolamine. Such compounds are known to be potent LPA mimetics (Sugiura et al., 1994; Lynch et al., 1997), but their activity at individual receptors has not been reported. In response to a very recent report by Bandoh and colleagues (1999) suggesting that LPAs with saturated fatty acids are not active at the human Edg-7 receptor, we also compared 14:0, 16:0, and 18:0 LPAs at Edg-2, Edg-4, and Edg-7 using the GTP[γ-35S] binding assay. The results of these assays are presented in Fig.6A–C. In agreement with Bandoh et al. (1999), who assayed Edg-4 and Edg-7 expressed in insect Sf 9 cells, we found that 18:1 LPA was 1 to 2 log orders less potent at Edg-7 than at Edg-4. Furthermore, we discovered that LPA mimetics in which the glycerol backbone is replaced by N-acyl ethanolamine phosphoric acid (NAEPA) are quite active at Edg-2 (rank order potency, 18:1 = 18:2 > LPA ≫ 20:1 = 14:1) and Edg-4 (rank order, LPA > 18:1 > 18:2 ≫ 20:1 = 14:1) but exhibit strikingly less activity at Edg-7. [γ-35S]GTP binding to HEK293T cell membranes in response to LPA s and NAEPAs. HEK293T cells were transfected with Edg-4 (A), Edg-7 (B), or Edg-2 (C) DNAs as well as with G protein DNAs (see Materials and Methods for details). Lipids were dissolved in chloroform and after determining their purity (by thin-layer chromatography) and concentration (colorimetric phosphate assay), dried and dissolved in buffer containing 0.1% fatty acid-free BSA. Typical values for minimum and maximum stimulation were 3,000 and 11,000 dpm, respectively. Bandoh and colleagues (1999) reported the unexpected finding that LPAs with saturated acyl groups were entirely inactive at Edg-7 (but active at Edg-4) at concentrations up to 10 μM. Although the low potency of LPA at Edg-7 in our assay system did not allow the determination of full dose-response curves, in contrast to those of Bandoh et al., our results (Fig. 6) indicate that 16:0 LPA and 18:0 LPA are agonists at Edg-7 as well as at Edg-4 and Edg-2. Although all compounds were less potent at Edg-7, the rank order potency of the LPA molecules (18:1 > 16:0 > 18:0 > 14:0) was the same for both Edg-4 and Edg-7. Edg-2, however, did not discriminate between 18:1 and 16:0 LPAs in this assay (Fig. 6C) Thus our data do not permit us to support the contention of Bandoh and colleagues that Edg-7 exhibits a peculiar preference for unsaturated LPAs. Finally, we investigated the expression pattern of the human Edg-7 gene in human and rat tissues by Northern analysis. As noted previously, we cloned Edg-7 from embryonic kidney 293 and prostate carcinoma PC-3 cells. This expression was reflected in our detection of a signal in RNA extracts of kidney and prostate (Fig. 7, A–D). Other human tissues positive for Edg-7 RNA were heart and several areas of human forebrain in which signals from frontal cortex, hippocampus, and amygdala were particularly strong (Fig. 7C). In rat tissues, we detected a signal in extracts of kidney and testis (Fig. 7D). In all extracts, a single prominent band was observed on autoradiograms after hybridization to32P-labeled Edg-7 DNA; the relative migration of this band was 4.0 and 3.3 kb in human and rat extracts, respectively. To explore further the expression of Edg-7 in prostate, we examined extracts of three standard human prostate cell lines, LNCaP, DU145, and PC-3 (Fig. 7B). Edg-7 mRNA levels were found to be higher in the androgen responsive line LNCaP. Northern blot analysis of Edg-7 expression in human and rat tissues. A, commercial (Clontech) human poly A+ RNA (2 μg/lane); B, total RNA from cultured PC-3, DU-145, and LNCaP cells (10 μg/lane); C, human brain poly A+ RNA (10 μg/lane except pons, which is 5 μg/lane); D, rat tissue poly A+ RNA (10 μg/lane). Exposure time for each autoradiogram was 3 days. The identification of LPA receptors is made problematic by the difficulty of radioligand binding and the widespread responsiveness of cultured mammalian cells to LPA. We responded to this dilemma in three ways. First, we used a [γ-35S]GTP binding assay that detects functional receptor/G protein complexes without the possibly confounding influence of downstream effector systems or endogenous GPCR signaling. Second, we used rat hepatoma Rh7777 cells, which are quite unusual in that they do not have detectable LPA responses (calcium mobilization or adenylyl cyclase inhibition). Finally, we used mammalian subtype-selective LPA mimetics that enable the use of the frog oocyte assay. Together, the results of these assays show that the Edg-7 DNA encodes a calcium mobilizing LPA receptor. Interestingly, Edg-7 couples effectively to Gi2αC351F when both are introduced into HEK293T cells via DNA-mediated transfection, but does not couple to endogenous Gi/oα proteins in Rh7777 cells when the receptor alone is introduced. We chose this mutant Giα protein so that if necessary we could suppress some background [γ-35S]GTP binding by treatment of cells with PTX or membranes withN-ethylmaleimide. (In practice, these maneuvers proved unnecessary.) Presumably, other G proteins such as Gqα would function in this assay also. Our laboratory had shown previously that two compounds structurally similar to LPA, NOEPA, and l-NPSPA (Suguira et al., 1994) are LPA mimetics on human breast cancer MDA MB231 and HEK293 cells (Lynch et al., 1997; Hooks et al., 1998). Our present data using the oocyte indicate the previous observations were from interactions proceeding, at least in part, through Edg-7. We took advantage of the [γ-35S]GTP binding assay to measure the relative potencies and efficacies of synthetic compounds at the Edg-2, Edg-4, and Edg-7 receptors. In a previous study (Lynch et al., 1997), we found that structural analogs in which ethanolamine replaced glycerol were full LPA mimetics when measured in calcium mobilization and adenylyl cyclase inhibition assays in MDA MB231 cells (these cells express Edg-2, -4, and -7 RNAs; Lynch, unpublished observations). In this assay, although the most active of these compounds (e.g., 18:1 or 18:2 NAEPA) were nearly indistinguishable from 18:1 LPA at Edg-4 (Fig. 6A) and more potent than 18:1 LPA at Edg-2 (Fig. 6C), all of the ethanolamine-based compounds exhibited only slight LPA mimetic activity at Edg-7 (Fig. 6B). Thus 18:1 NAEPA is a prototype for compounds that are Edg-2- and Edg-4- (versus Edg-7-) selective. While this paper was under initial review, Bandoh et al. (1999)published their independent discovery of Edg-7. Both groups report the same nucleotide and amino acid sequence and agree on Edg-7's calcium mobilizing properties and tissue localization. However, there are several differences between the two reports. Bandoh and colleagues report that Edg-7 and Edg-4, when expressed in insect Sf9 cells, stimulate cAMP accumulation, whereas Edg-2 does not affect cAMP levels. This result is somewhat surprising, particularly regarding the apparent lack of Gi/oα coupling by Edg-2, which has been demonstrated repeatedly in mammalian systems (e.g., our Fig. 4). Perhaps the cAMP accumulation by Edg-4 and Edg-7 in the Sf9 system is similar to the atypical protein kinase C activation of adenylyl cyclase type II in RAW264.7 macrophages reported recently (Lin et al., 1999). More interesting to us was the demonstration by Bandoh et al. that LPAs containing a saturated acyl group were entirely inactive at Edg-7 at concentrations up to 10 μM. However, our results using the GTP binding assay contradict those of Bandoh et al. in that we found 16:0 and 18:0 LPAs were active at Edg-7, albeit with lower potency than 18:1 LPA. This difference in results, which we are at a loss to explain, is particularly striking in that the assay system of Bandoh et al. (calcium mobilization in Sf9 cells) has an intrinsic amplification that renders their system more sensitive to LPA. Our results suggest that if one's goal is to design LPA receptor-selective compounds, there is relatively little to gain in modulating the degree of unsaturation of the acyl chain. Our results with all three LPA receptors suggest the optimal acyl chain length is 16 to 18. The existence of a third LPA receptor has been suspected because the other calcium-mobilizing LPA receptor, Edg-4, was reported to have limited tissue distribution (An et al., 1998a). Furthermore, we and others (Fischer et al., 1998) have found using RT-PCR that some cell lines, e.g., HEK293, show robust calcium responses to LPA but lack detectable Edg-4 RNA. Although Edg-7 might be this “missing” LPA receptor, the high efficacy and potency of 18:1 NAEPA in mobilizing calcium in HEK293 cells (Lynch, unpublished observations) as well as a limited structure-activity relationship study with human platelets (Gueguen et al., 1999) suggest that additional LPA receptors might exist. The existence of at least eight Edg receptors for lysophospholipids suggests that receptor subtype selective compounds are essential for developing a better understanding of lysolipid phosphoric acid biology. Finally, the expression of Edg-7 in prostate and several prostatic cell lines is intriguing in view of two reports regarding LPA signaling in these cells lines. Meier and colleagues (Qi et al., 1998) showed that LPA activates phospholipase D in PC-3 but not in LNCaP cells. Furthermore, the LPA degrading phosphatase, PAP2a (LPP1), is highly expressed in prostate and has been shown to be induced by androgen in LNCaP cells (Urix et al., 1998). We are currently using Edg receptor subtype selective compounds to determine the role of individual LPA receptors in prostatic LPA signaling. We thank Dr. Marcel E. Durieux (Anesthesiology, University of Virginia) for the use of his laboratory's oocyte recording station; Elizabeth Hosfield (Pharmacology, University of Virginia) for help in subcloning Edg-7 DNAs; Shelley B. Hooks (Pharmacology, University of Virginia) for a gift PC-3 cell RNA, and Regina Cheng (University of Toronto) for help with Northern analysis. We also thank Dr. Timothy Macdonald (Chemistry, University of Virginia) and colleagues for the gift of NAEPA compounds and are grateful for Dr. Erik Hewlett's gift of pertussis toxin, which was prepared in his laboratory (Department of Internal Medicine, University of Virginia) with financial support from the John Lee Pratt Bequest to the University of Virginia. We acknowledge Dr. George McAllister (Merck, Sharpe & Dohme, Harlow, UK) for suggesting the use of the [γ-35S]GTP binding assay to test lysolipid phosphatidates. This work was supported by National Institutes of Health Research Grants R01 GM52722 and R21 CA69848. C.E.H. is supported by a National Research Service Award predoctoral traineeship (T32 GM07055). (1998a) Characterization of a novel subtype of human G-protein coupled receptor for lysophosphatidic acid. J Biol Chem 273:7906–7910. (1997) Identification of cDNAs encoding two G protein-coupled receptors for lysophingolipids. FEBS Lett 417:279–282. (1998b) Recombinant human G protein-coupled lysophosphatidic acid receptors mediate intracellular calcium mobilization. Mol Pharmacol 54:881–888. 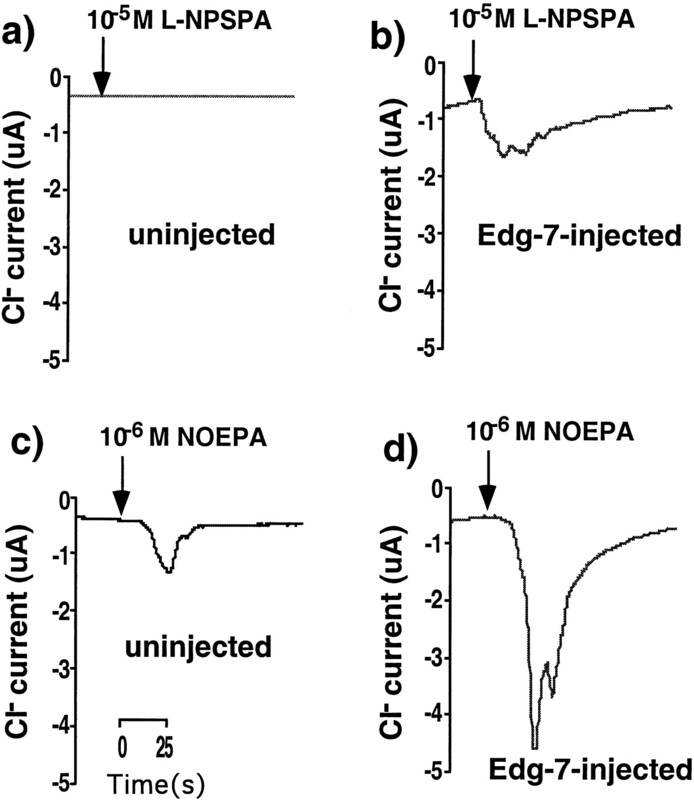 (1999) Molecular cloning and characterization of a novel human G-protein-coupled receptor, EDG7, for lysophosphatidic acid. J Biol Chem 274:27776–27785. (1999) A growing family of receptor genes for lysophosphatidic acid (LPA) and other lysosphingolipids (LPs). Cell Biochem Biophys 30:213–242. (1992) Lysophosphatidic acid induces a pertussis toxin-sensitive Ca2+-activated Cl− current in Xenopus laevis oocytes. Am J Physiol 263:C896–C900. (1993) Endogenous responses to sphingosine-1-phosphate in X. laevis oocytes: Similarities with lysophosphatidic acid signaling. Am J Physiol 264:C1360–C1364. (1993) The bioactive phospholipid lysophosphatidic acid is released from activated platelets. Biochem J 291:677–680. (1998) Naturally occurring analogs of lysophosphatidic acid elicit different cellular responses through selective activation of multiple receptor subtypes. Mol Pharmacol 54:979–988. (1998) A single receptor encoded by vzg-1/lpa1/edg-2 couples to G proteins and mediates multiple cellular responses to lysophosphatidic acid. Proc Natl Acad Sci USA 95:6151–6156. (1989) Identification of the molecular species of lysophosphatidic acid produced when platelets are stimulated by thrombin. Biochim Biophys Acta 1001:282–285. (1999) The novel sphingosine 1-phosphate receptor AGR16 is coupled via pertussis toxin-sensitive and -insensitive G-proteins to multiple pathways. Biochem J 337:67–75. (1999) Structure-activity analysis of the effects of lysophosphatidic acid on platelet aggregation. Biochemistry 38:8440–8450. (1996) Ventricular zone gene-1 (vzg-1) encodes a lysophosphatidic acid receptor expressed in neurogenic regions of the developing cerebral cortex. J Cell Biol 135:1071–1083. (1990) An abundant transcript induced in differentiating human endothelial cells encodes a polypeptide with structural similarities to G-protein-coupled receptors. J Biol Chem 265:9308–9313. (1998) Characterization of a receptor subtype-selective lysophosphatidic acid mimetic. Mol Pharmacol 53:188–194. (1993) Lysophosphatidic acid stimulates mitogen-activated protein kinase activation via a G-protein-coupled pathway requiring p21ras and p74raf-1. J Biol Chem 268:20717–20720. Im D-S, Heise CE, Ancellin N, O'Dowd BF, Shei G-J, Heavens RP, Rigby MR, Hla T, Mandala S, McAllister G, George SR and Lynch KR (2000) Characterization of a novel sphingosine 1-phosphate receptor, Edg-8.J Biol Chem, in press. (1997) Lysophosphatidic acid: A novel growth and survival factor for renal proximal tubular cells. Am J Physiol 273:F575–F585. (1996) N-palmitoyl-serine and N-palmitoyl-tyrosine phosphoric acids are selective competitive antagonists of the lysophosphatidic acid receptors. Mol Pharmacol 50:616–623. (1999) Roles of atypical protein kinase C in lysophosphatidic acid-induced type II adenylyl cyclase activation in RAW264.7 macrophages. Br J Pharmacol 128:1189–1198. (1997) Structure-activity relationships in lysophosphatidic acid: The 2-hydroxyl moiety. Mol Pharmacol 52:75–81. (1996) A novel gene codes for a putative G protein-coupled receptor with an abundant expression in brain. FEBS Lett 394:325–329. (1999) EDG3 is a functional receptor specific for sphingosine 1-phosphate and sphingosylphosphorylcholine with signaling characteristics distinct from EDG1 and AGR16. Biochem Biophys Res Comm 260:203–208. (1988) Improved tools for biological sequence comparison. Proc Natl Acad Sci USA 85:2444–2448. (1998) Lysophosphatidic acid stimulates phospholipase D activity and cell proliferation in PC-3 human prostate cancer cells. J Cell Physiol 174:261–272. (1999) Activation of phospholipase C-Ca2+ system by sphingosine 1-phosphate in CHO cells transfected with Edg3, a putative lipid receptor. FEBS Lett 443:25–30. (1994) Biochemical characterization of the interaction of lipid phosphoric acids with human platelets: Comparison with platelet activating factor. Arch Biochem Biophys 311:358–368. (1994) Lysophosphatidic acids induce proliferation of cultured vascular smooth muscle cells from rat aorta. Am J Physiol 267:C204–C210. (1998) Identification of the phosphatidic acid phosphatase type 2a isozyme as an androgen-regulated gene in the human prostate adenocarcinoma cell line LNCaP. J Biol Chem 273:4660–4665. (1998) Alpha2-adrenergic receptor-mediator release of lysophosphatidic acid in adipocytes. J Clin Invest 101:1431–1438. (1989) Lysophosphatidate induced cell proliferation: Identification and dissection of signaling pathways mediated by G proteins. Cell 59:45–54. 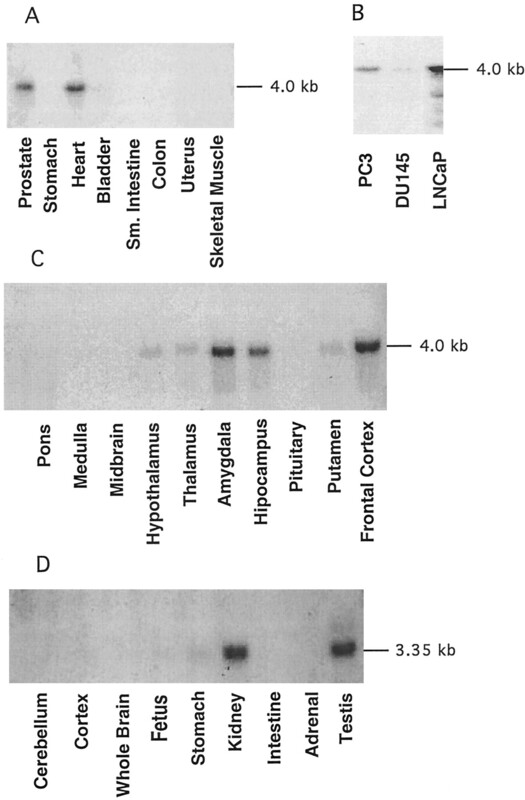 (1999) Schwann cell survival mediated by the signaling phospholipid lysophosphatidic acid. Proc Natl Acad Sci USA 96:5233–5238. (1977) Transfer of purified Herpes virus thymidine kinase gene into cultured mouse cells. Cell 11:223–232.